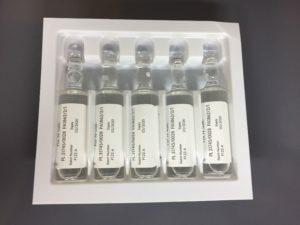 In some recent batches of this product there is a minor cosmetic difference from previous batches in the coloured rings around the top of the ampoules. Ampoules in previous batches have two white coloured rings around the top of the ampoule. In some of the new batches, customers might see ampoules with either one white or one silver ring in the same carton. This difference in appearance is cosmetic and does not affect either the contents of the ampoule or the ease of opening. By the end of 2017 all colour rings will be removed from ampoules of this product. The photograph below illustrates the subtle colour variation in the rings at the top of the ampoules.